I thought that in returning to blogging more regularly I'd write one of my old-style blog posts, the kind where I take a handful of thought pebbles (which I've been picking up in the places where things foam and froth) out of my pocket and line them up on a table for us to look at together. If you remember those posts from a while back, you'll be ready to read (or gone by now). If you're new to the blog and haven't seen this yet, I'll explain how it works. I'll say, "The other day..." and then "that reminded me of" and so on, until you think I can' t possibly jam in one more somewhat-related thing. Then I'll attempt to come to a conclusion, at which point you'll realize that I don't really have a conclusion, just a handful of mental pebbles, and that your conclusion is as good as mine. I started writing this blog post several months ago, but the part of me that was finishing the book wouldn't allow me to complete it. This was actually a good thing, because some of the later pebbles I added to the pocket took the ideas in new directions. I would not be surprised to find that you have some pebbles like these in a pocket of your own. Feel free to place them into the comments, which are conveniently pebble sized. Here's the first pebble in my pocket, the one that got me started on picking up all the other pebbles. Lately, sometimes, when I'm out and about, I've taken to buying myself a bottle of Diet Coke. I know it's bad for me. I call it "my little bottle of evil." There is no need to reveal to you how much soda I used to drink ages ago, and how I swore it off forever, and how I'm now able to have a soda once in a while without getting dragged back into a bad habit. The pebble I've been turning round and round in my mind lately is what I do when I get the soda. I unscrew the cap of the soda bottle, and then my hand takes the cap and holds it in front of my eyes for a few seconds. It was several sodas before I noticed I was doing this, and it was several more sodas before I realized why I was doing it. It's because the cap used to be part of the reason I drank so much soda. During that time I also bought as many sodas as I could afford, for the same reason. Because of this I developed a habit of reflexively peering into every soda-bottle lid to see if I had won yet. Evidently, I still do this. So the other day I'm sitting in the parking lot at the grocery store peering into a cap, and I'm thinking: I wonder what impact that had on me, reading "not a winner" so many times. But I don't really need to ask the question. I remember what I thought about it. I thought: I'm not a winner. According to the internet, a lot of people in my generation thought the same thing. I wonder what impact that had on all of us. Have you read your email? What? The computer said you failed? Mom, what did the computer say exactly? I clicked on that thing, like you told me, and it said, "Failed to connect to internet." Mom! It didn't mean you failed! It meant it failed. The computer failed. I don't know. I don't want to try it anymore. I don't think I can do it. And she didn't try it again. Here's another pebble. In a favorite book called Programming as if People Mattered, there's a great story. It goes something like this. A software development company was doing user testing on a new software product. A user came into the testing lab and sat down in front of a computer on which the new software was running. A tester sat ready to observe the user. The user looked at the screen, then promptly switched off the computer. The tester, aghast, asked the user why they had turned off the computer. The user said, "Because it told me to." The tester then realized that what the user saw on the screen was the program's start-up screen, which prominently displayed the company's name. The company's name was End User Computing. I thought for a while that this third pebble didn't belong in the same pocket as the other two, because it isn't about a message to a user. But after a while I realized that it does fit, because it's about a message a user thought was being sent to them. We have become so accustomed to cryptic messages from software that we see them even when they aren't there. Thinking about cryptic error messages led me to remember something that happened to me about fifteen years ago. I was using a computer when an error message appeared. The message was so strange and funny that I immediately took a screen shot and saved it. I still have it. I promise you that this is a real screen shot. What struck me about these four pebbles (stories) was that in each, someone told a story to someone else about something that happened, a failure of some sort. In each case, the sentences used to tell the story were empty. They had no people in them. Not a winner; failed to connect; end user computing; cannot delete. I wondered: why were these stories so empty? Because of this I started looking around on the internet for research about the way people speak to each other, specifically in their use (or lack of use) of words that refer to people. I soon found The Secret Life of Pronouns, which summarizes research by James Pennebaker and others into the use of "function words" such as pronouns, conjunctions, and prepositions. These words are not usually necessary to provide meaning, but serve instead to convey social messages. Function words are social. They tell us about the author; they tell us about the relationship between the author and the recipient; and they tell us about the relationship between the author and the topic itself. ... By analyzing function words, we started to get a sense of who people are, what their relationships are, what they think about themselves, and how they connect with others. According to Pennebaker, people who consider themselves of low status, and people who have little confidence or are depressed, tend to use more personal pronouns such as "I" because they are more focused on themselves than on others. People who consider themselves to be in power, or who feel more confident, tend to use fewer pronouns. In particular, they use "I" less often. So I go in and I analyze my own emails. I'm the same as everybody else. I go in and I look at the email that I get from an undergraduate student. "Dear Dr. Pennebaker, I would like to know if I could possibly meet with you because I need to change my grade." And I write back, "Dear student, thank you so much for your email. Unfortunately, the way the grade systems work, blah blah blah." I look at my email to the dean. "Dear Dean, I'm Jamie Pennebaker, and I would like to ask you if I could do this and I could do that and I could do this." And the dean writes back, "Dear Jamie, thank you so much for your email..." and so forth. What do Pennebaker's findings about pronouns mean about the four stories I've told you above? The people who wrote them might be very sure of themselves; they might consider themselves in a position of power in relation to their intended audiences; and they might be lying. My guess is that all of these factors apply to some extent when the creators of products speak to their users. As I was thinking about these things, I told my son about them. He said, "If you want to collect stories about failures, you should look at 404 error pages." (You can tell that he's almost eleven now.) This was an excellent idea, so I did it. Yes, I'm now going to tell you about another of my small, mostly pointless internet research projects. I looked at the content of error messages on fifty web sites by seeking a fictitious whatever.com/test.html at each site. My method of selecting sites was unscientific. I typed in all the major sites I could think of. They tended to run in groups: stores, pet-related sites, credit card companies, banks, television networks, charities, social media sites, newspapers, magazines, government agencies, and so on. I threw out four web sites that had the default Apache 404 page (no point counting a site if nobody chose a message). I threw out four web sites where there was no error page at all. Typing in a non-existent URL simply brought you to the site's home page with no explanation. That's another strange phenomenon -- no story at all -- and possibly worthy of exploration at another time, but I put it aside (in a new mental pocket) for now. I threw out three web sites where "test.html" led to either an entirely blank page or to an actual test page (have a look at target.com/test.html for a laugh). 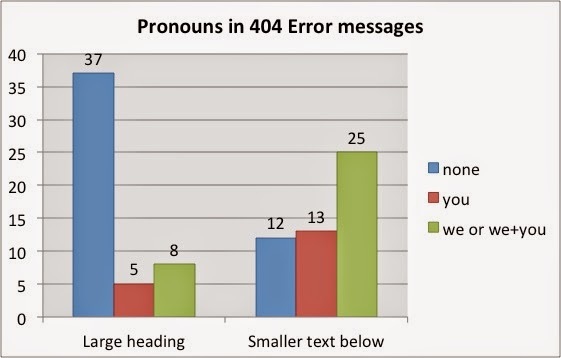 On 84% of the web sites, the large heading message had either no pronouns or only "you." Pennebaker would say that these statements used the language of authority and confidence. However, in the smaller texts that followed, only 50% of the web sites used authoritative language. What does this mean? My guess is that it has something to do with the intensity of feelings people have about the products they create. Words in larger print are usually considered to be more loudly spoken. I got the feeling that people were shouting in the headings (defending their reputations loudly), then pulling the user in close and whispering (and sometimes admitting to a lack of perfection) in the small print. I didn't find any patterns as to which sorts of web sites had which sorts of messages. Charities didn't have "nicer" messages than newspapers, or anything like that, as far as I could tell in such a tiny sample. I don't suppose most organizations put a lot of effort into designing their 404 error pages. It is probably a support task given to low-status employees. I suspect that the way 404 pages read has to do more with who got stuck writing the 404 error message than with anything else. Some people are more self-assured than others, so it makes sense that some of the people who get stuck writing these error messages might be unassuming types. But the majority wrote without pronouns when they wrote loudly. Looking through all those 404 page messages brought to mind my theory of fractional apology. I began theoretical work on this theory a long time ago, in college, when I was learning how to make friends, and I have elaborated on it ever since. It goes like this. All apologies are stories about what happened, but different types of apologies tell different stories with different people in them. A full apology ("I'm sorry I hurt you") tells the story of what happened with all of the people present and accounted for. A half apology ("I'm sorry if I hurt you") tells the same story, but with the offender only halfway in the story. The word "if" means that the offender accepts only conditional responsibility for what happened. Of course there are ways of saying the word "if" that imply that condition to be unlikely, if not illusory. A quarter apology ("I'm sorry that you think I hurt you") tells the story with only one person in it. The words "you think" remove the offender from the story completely, leaving only the offended person experiencing a fantasy of offense. As with "if," there are ways of saying "you think" that render the fantasy extreme. A non-apology ("That's too bad" or "Mistakes were made") has nobody in the story at all: no offender, no offended person, just a meaningless event happening to nobody. Most of the large-heading texts of the 404 pages I looked at, and the messages that started me on this mental perambulation (not a winner, failed to connect, etc) fit into the category of non-apologies or quarter apologies. 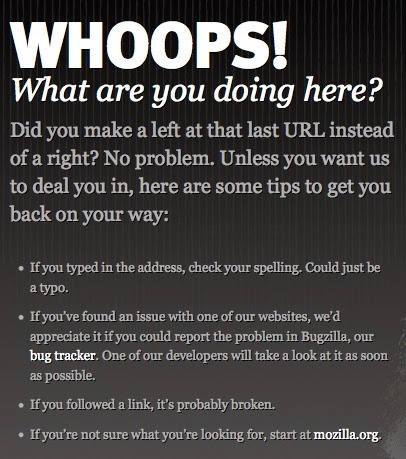 Some of the detailed help texts under the large 404 headings could count as half apologies. At this point I was reminded of an observation I've made over the years about stories I've collected from people who create products. When I've collected stories from software developers, salespeople, customer service representatives, and so on, I've noticed a peculiar feeling of disdain for, or even disgust with, the users of products. In many of the stories I've heard, users have been portrayed as stupid, slow to learn, fickle, and prone to falling into baseless superstitions. Not every product creator expresses these feelings, but I've seen the phenomenon enough times to wonder where it comes from. If the people who create products have feelings of disdain for their users, it makes sense that they would use the language of someone "speaking down," that is, removing pronouns from their speech. I have come up with two competing hypotheses about why product creators might speak down to users. The first hypothesis is the more obvious one: people who know a lot about a product they have created can legitimately consider themselves to be more knowledgeable about the product than their users. And they are naturally more confident and powerful, because they created the product and can control it, whereas users don't have that power. Thus it makes sense for product creators to use the language of authority. Let's call this the natural authority hypothesis. My second hypothesis is the opposite of the first. When people create products for users, they enter into a position of dependence upon them. If I create a web site and nobody comes to it, or if I design a soda bottle and nobody buys it, I will not be able to keep creating those things. Thus even though product creators might be more knowledgeable than users, they are less powerful. If I need you and you don't need me, I may take on the language of power in a bid to overcome my dependent position through posturing and bluffing (and possibly self-deception). Each of these things would lead me to use fewer pronouns. Let's call this the compensation hypothesis. One other piece of evidence, if you can call it that, is that I have also collected some stories on the other side of this imbalance, from the users of systems. I've noticed that a lot of users see developers as powerful (they can create these amazing systems we can barely use), mysterious (we can only guess at what they might do next), and consistent (they will always act the way they do now). This evidence could support either of my above hypotheses. If product creators use the language of authority because they legitimately have it, users rightly understand their place in the exchange. But if product creators use the language of authority to compensate for their powerlessness, maybe users have been hoodwinked into believing they are powerless when in fact they hold the power in the relationship. If users have been tricked, they will eventually discover the truth, and this could lead to disillusionment with products. I feel like I've seen some of that disillusionment myself. Have you? [D]eveloping a sense of agency is crucial to using mistakes more effectively. When something you're working on goes wrong, many parties may have a role. Yet focusing on all those external parties distracts you from what you can control--yourself and how you react to situations. Believing that you can manage your life requires that you take responsibility for your actions and deal with their consequences. That requires forgetting about other influences and owning the result. Agency is the capacity of an actor to act in a world. If you don't have a sense of agency with respect to something that has happened, you don't see yourself as having acted in the world of what happened. You have removed yourself -- distanced yourself -- from the story. What John is saying is that people who habitually remove themselves from stories when they don't go well lose the ability to learn from their mistakes. This is not a good thing. This in turn reminded me of a blog post I wrote, let's see, four (four!) years ago, about celebrity worship as narrative sensemaking. I'm going to excerpt the relevant parts of that post to save you reading the whole thing. The Father. You will understand, sir, born as we are for the stage . . . The Manager. Are you amateur actors then? The Father. No. I say born for the stage, because . . . The Manager. Oh, nonsense. You're an old hand, you know. The Father. No sir, no. We act that rôle for which we have been cast, that rôle which we are given in life. And in my own case, passion itself, as usually happens, becomes a trifle theatrical when it is exalted. The Manager. Well, well, that will do. But you see, without an author . . . I could give you the address of an author if you like . . . The Father. No, no. Look here! You must be the author. The Manager. I? What are you talking about? The Father. Yes, you, you! Why not? The Manager. Because I have never been an author: that's why. The Father. Then why not turn author now? Everybody does it. You don't want any special qualities. Your task is made much easier by the fact that we are all here alive before you . . . The Manager [determining to make fun of him]. Ah. excellent! Then you'll be saying next that you, with this comedy of yours that you brought here to act, are truer and more real than I am. The Father [with the greatest seriousness]. But of course; without doubt! The Father. Why, I thought you'd understand that from the beginning. The Manager. More real than I? The Father. If your reality can change from one day to another . . . The Manager. But everyone knows it can change. It is always changing, the same as anyone else's. The Father [with a cry]. No, sir, not ours! Look here! That is the very difference! Our reality doesn't change: it can't change! It can't be other than what it is, because it is already fixed for ever. It's terrible. Ours is an immutable reality which should make you shudder when you approach us if you are really conscious of the fact that your reality is a mere transitory and fleeting illusion, taking this form today and that tomorrow, according to the conditions, according to your will, your sentiments, which in turn are controlled by an intellect that shows them to you today in one manner and tomorrow . . . who knows how? . . . Illusions of reality represented in this fatuous comedy of life that never ends, nor can ever end! Because if tomorrow it were to end . . . then why, all would be finished. People engage in societal sensemaking in order to connect to the larger story, the grand story of human existence. If they didn't, "all would be finished." I hope you'll understand why I included this section. When we refuse to act as characters in our own stories, when we send away these characters in search of an author, we become nothing more than transitory and fleeting illusions, taking this form today and that tomorrow. Each error message, each 404 page, each fractional apology stands alone, unable to help us make sense of our creations and of our lives. We need to populate our own stories so that we can connect to the larger story, the grand story of human existence. The consequences of abandoning our own stories could be devastating. A missile is a device created by people to kill people. But when the people who wrote this script told a story to other people about the missile, they removed all of the people from the story. Apparently this lonely little missile goes through its life without any creators, without any givers of instructions, and without any awareness of what will happen to anyone when it gets to where it is going. But we all know that the people are what matter in this story: the people who created the missile, and the people who will die because of its journey. I think it's curious that this story has become such an urban legend on the internet, passed from one hand to another for decades. Maybe it says something to us about how we've created systems from which we have carefully removed our own presence. Maybe it says something about our societal need to make sense of this fact. Maybe it says something about our need to reduce the distance between what we have created and who we are. Hey, wait a minute! This is grass! We've been eating grass! Hey, wait a minute! We are people! Corporations are made of people! I'm now starting to realize why this is true. It's because corpo-speak is usually devoid of pronouns. We come up with so many elaborate ways to avoid admitting that people are involved in corporations: human resources (people), social capital (people talking to people), knowledge management (people helping people learn and share -- with people), and so on. James Pennebaker said that function words like pronouns tell us "who people are, what their relationships are, what they think about themselves, and how they connect with others." When people avoid using pronouns, maybe they are not just trying to conceal how they connect with others. Maybe they are trying not to connect at all. 13. What's a leader to do? I seem to be saying here that nobody should speak in the language of power. I seem to be saying that everyone should pepper their sentences with "I" and "we" to avoid losing their capacity to connect and think clearly. I seem to be saying that in order to learn and grow as people, we must have no leaders. But clearly people need leaders. Everyone leads at some time or other, and everyone needs to be able to convey authority in ways other people can understand. Perhaps I am presenting a double bind. Pennebaker says that people signal authority and confidence by dropping people out of stories; and others say that people who drop people out of stories lose connection and sensemaking ability. But if a leader must use the language of power to convey authority, how can they avoid these consequences? Is it not the responsibility of those in power to speak in ways that show control? Part of me would agree that in some contexts it is necessary for people who hold power and responsibility to speak in the language of power and to drop people out of stories. If a leader on whom I depended was negotiating on my behalf for something needed by my community, I would want them to use the language of authority and confidence rather than submission and fear. However, another part of me has other ideas. First, I think it must be part of the responsibility that comes with power to recognize the impact of characterless stories on our ability to make sense and to connect. The language of power isolates ("it's lonely at the top") and reduces self-awareness ("the fog of leadership"). When we feel that we must use the language of power, we should also feel obliged to periodically renew our abilities by deliberately populating stories, perhaps in the context of speech that does not require signs of authority -- with mentors, perhaps, or trusted friends. We should not allow ourselves to fall into the habit of keeping people out of all of our stories. The servant-leader is servant first… It begins with the natural feeling that one wants to serve, to serve first. ... The difference manifests itself in the care taken by the servant-first to make sure that other people’s highest priority needs are being served. The best test, and difficult to administer, is: Do those served grow as persons? Do they, while being served, become healthier, wiser, freer, more autonomous, more likely themselves to become servants? And, what is the effect on the least privileged in society? Will they benefit or at least not be further deprived? Notice how many times people are mentioned in that quote. This is certainly not a story in search of characters. Leaders who serve using this model, it seems to me, would take it as their responsibility find a way to lead without telling stories empty of people. I think I like that option best of all. There is just one more pebble left in my pocket. I wondered what sort of "not a winner" messages my new soda-bottle cap might lead to, so I went to the Coca-Cola web site to type in the cryptic code I found inside. I was surprised to find that bottle caps no longer result in failure stories. The old contest has been converted to a loyalty program. Now people register at the web site, and they get points for each soda they buy. Eventually the points add up to discounts and free things. People also get contest entries with their points, but that's not the central activity. But what's the language like on the Coke rewards web site? What pronouns do they use? What stories do they tell? I didn't want to register for an account (no more barnacles please), but I did look around on the pages of the site I could see without being signed in. There's more to life than your mortgage. Enter now for a chance to win a $24,000 Visa gift card to put towards your mortgage. What will fit into your life when you kick your mortgage out? Shop the My Coke Rewards catalog and use your MCR points for the things you want most. Whether you're passionate about technology or love great food, want to keep up on the latest Hollywood happenings or send flowers to someone special, with our great rewards you can do it all! Just sign in, choose your favorite item from our rewards catalog and complete the checkout process. It takes only minutes - and when you're done, you'll have a great little reward just for drinking your favorite beverage. Support a Good Cause. It doesn't take a lot of effort, but every time you've enjoyed one of our products, you've helped Coca-Cola make donations to a wide range of great causes, including scholarships, the environment, and safe havens where kids can learn and grow. Now, you can continue to make an even bigger difference. By donating your My Coke Rewards points to a cause, you can truly help others in our communities. This is better: the word "our" comes up multiple times. There may actually be somebody in there. It certainly is an improvement over "not a winner," even though I had to go hunting to find it. My college self holds up her bottle cap and smiles. What does this all mean if you are a creator of products? I don't exactly know. These mental perambulations usually peter out and end without any definite conclusions. I'll try and come up with some conclusions anyway, to make you happy. When we tell stories from which we have removed ourselves, we may inadvertently place ourselves into a position of power over our audiences. This may reduce their ability to help themselves, and it may increase their dependence on us. If our reason for speaking to people in the first place is to help them learn and become more capable of doing something, we are working against our own goals by speaking in this way. When we tell stories from which we have removed ourselves, we have reduced our own capacity to make sense of what has happened. This could lead us into complacency, into declining value in the things we create and in the work we do, and into a sense of isolation from our lives and from the lives of the people we most want to connect with. When we catch ourselves telling stories from which we have removed ourselves, we can take the opportunity to ponder why we did this. Do we want to appear knowledgeable? Do we want control over the situation? Do we want distance from the situation? Do we want to compensate for feelings of dependence or lack of control? We should use our own words as indicators that can help us avoid problems of self-deception. When someone tells us a story from which they have removed themselves (like "not a winner"), we should not rush to place ourselves into the story (by for example believing that "You are not a winner" is the story being told). We should instead recognize that the story has no people in it and think about what sorts of people might legitimately be in the story. When someone tells us a story from which they have removed themselves, we can learn something about the person, or the product. The person might see themselves in a different relationship with us than we would like to have with them. We might take different actions in our relationships with them as a result. That's it: all my pretty pebbles are lined up for you to see, and I've placed them into one shape. But this is only a handful of pebbles, and this is only one shape. You can place more pebbles, and more shapes you find, in the comments. Thanks for the comment, John! I've had similar experiences supporting software. People have such low expectations about support (of anything) that just being fully human can make people happy, even if you can't fix the problem they are having. Product creators who can keep themselves in their stories have a competitive advantage. It takes courage to say "the site is our responsibility," but this is one situation where the right thing to do is also the smart thing to do. Folks, you can try John's inspired and inspiring journaling project at http://www.threeminutejournal.com.